Thoughts on Fifteenish Months | Nicole, Deipnosophist. So here I am again, trying to encapsulate what it’s like to be in the life of a growing child. I’m afraid that trying to sum up everything isn’t going to work tonight. The past few weeks have been a string of difficult days. Ainsley is strong and bright and independent…and a Daddy’s girl. I dislike labels like that; they pit one parent against the other and don’t help strengthen a family. But in this case it is so true it hurts. Ainsley loves her fun daddy. He makes her laugh but is still firm when she needs guidelines. I am not as good at being silly. As a result of many factors, she’s started to like anyone but me. She never wants me to hold her even though every other blood relative is worthy of the honor. She panicks and throws a tantrum when she’s left alone with me. She barely hugs me and won’t smile at me very often. Imagine, if you will, sacrificing yourself for the life of another person and then experiencing utter rejection. I expected she’d reject me when she was eight or fourteen, but not so young. I have questioned everything I do. I won’t go into my parenting methods here, because I don’t think what I’m doing or not doing is the problem. The problem is a matter of her feelings toward me and it’s a different pain than any I’ve felt. Writing this post has even been hard. How can I admit to the world that I’m not that great of a Mom? Maybe I’m good at providing nutrition and at educational opportunities and a fun activities, but not so good at being somebody’s mommy, the person who loved them more than anyone else ever will, the person that any baby would want in a time of need. I admit that this cold front has made me not do as well at parenting. My sister reminded me that people, especially children, need my patience when they deserve it the least. So I’ve been trying to improve and to open myself to Ainsley even when it hurts so much I can’t talk about it. It’s working! In the past few days, Ainsley’s started to hug me again and to want to be with me. I’m still not her favorite person but she is at least taking me back in her social circle. 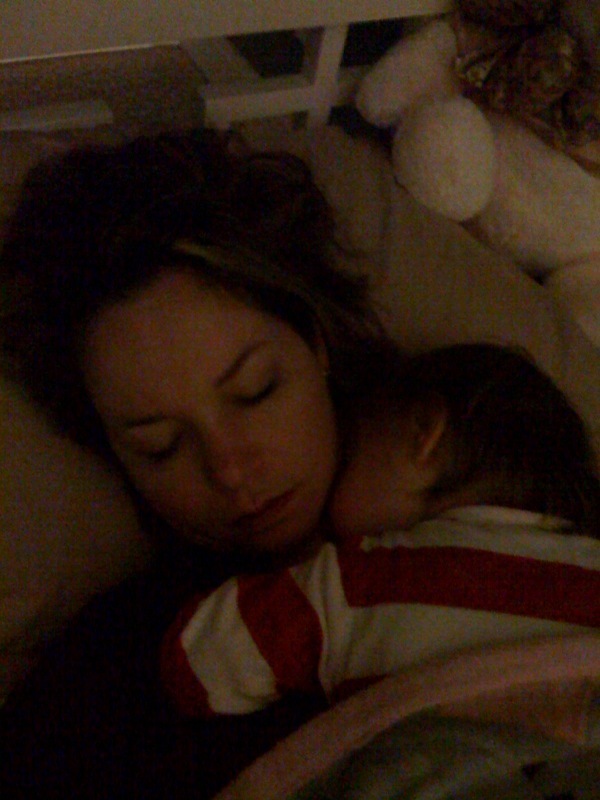 She awoke screaming in her sleep last night and I cradled her for an hour and a half while she settled into slumber again. I could have stayed there all night, but she sleeps better in her crib and me in my bed. I remember thinking at the time that I would have balked at losing sleep for any reason! 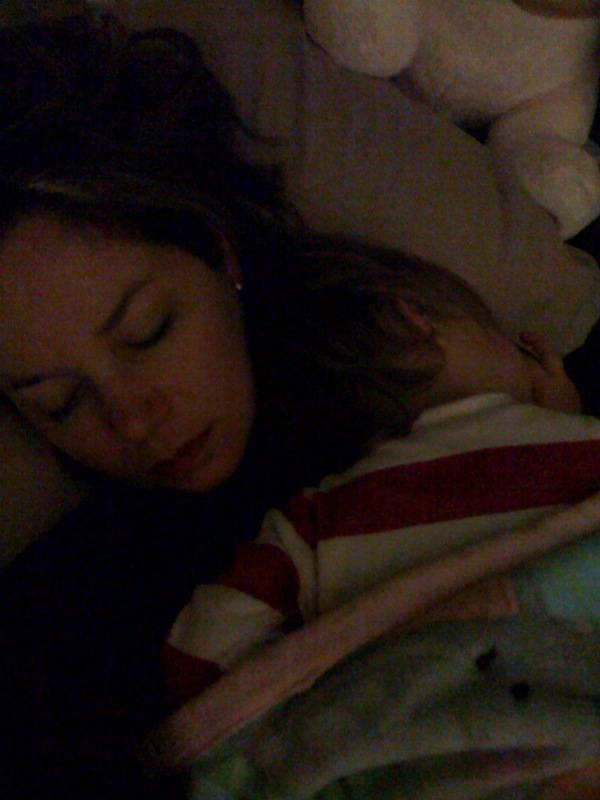 These pictures were taken by me when Ainsley was starting to sleep soundly again. I took these them with my eyes closed, but I hope you can see what these moments are. They are a mother who loves her child enough to break down any wall and do anything. Our daughter alternates between me being her favorite and her mother being her favorite. It is nothing for her to pick the same parent to read at bedtime 2-3 weeks in a row and then with no warning switch to the other parent for as long or longer. I have to agree that patience is the best defense against feeling of rejection. I have to say that after several days in a row of asking if I can read her bedtime story and put her to bed and have her say “NO, momma read.” not much leaves me feeling worse. Daughters are sassy, this much I’ve know. I think it’s my life’s purpose to feed them, wipe them, dress them, brush them, and SURVIVE them. I’m trying so hard to weather this. It’s still going. It’s even worse now, with her collapsing on the floor as though I’ve smacked her, when I walk in the room.